Pink Elephants isn’t something you see in everyday life. But, since Thunderkick Gaming have decided to create a slot based around it, you just might want to. With over the top graphics that would look right at home in an animated movie, combined with some fabulous features you just can’t go wrong with this slot. 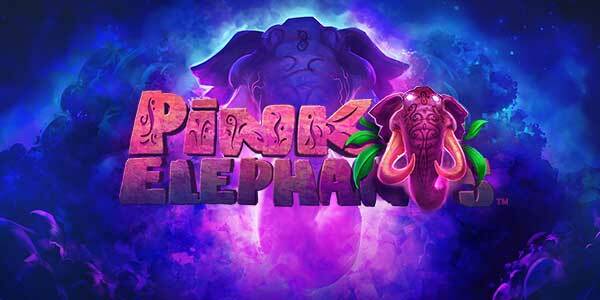 Pink Elephants is a 6-reel, 4096 ways to win slot offering an amazing 96.10% RTP for intrepid travellers to the game. It is set in an African desert with a dry arid landscape as a backdrop and transparent reels spinning on the top. There are lots of interesting characters too with higher value symbols being the Pink Elephants face and four different versions of a meerkat, differentiated by the coloured orb they sit inside. Lower values are made up of A, K, Q, J, 10 and 9, all designed to look like small stones and rocks found on the desert floor. Bet Amounts –Betting begins at 10p per spin and can be increased to the maximum of £100 per spin. In order to change your bet, click on the casino chip symbol to the left of the spin button and the bet screen will now be shown. All you need to do is click your bet of choice, it’s that simple. Once you have clicked your bet you will be returned to the main screen and can start spinning the reels. Wild Symbol – A glowing purple ‘w’ is your wild symbol in Pink Elephants. We know it’s not very original, but it works none the less. It will substitute for all other symbols except the peanut scatter. Scatter Symbol – It is well known that elephants love peanuts, so it makes sense that the scatter symbol is depicted by a peanut. Land three or more of the scatter anywhere on the reels to trigger the bonus round. Mystery Scatter Feature – At any point during the main game you could see this feature being activated. Up to x5 peanut scatter symbols can be added to the reels, in a bid to aid the bonus spins feature to be triggered. Bonus Spins Feature – Land 3 or more of the peanut scatter symbol anywhere on the reels to trigger the bonus game. You will now be allocated a number of spins, which are dependant upon the number of scatters you had on the reels when it triggered. X6 scatter symbols will award 19 bonus spins. It doesn’t end there though, because if you land more peanut scatter symbols during the bonus games you will be allocated another amount of spins. Except during the bonus round you are awarded spins for just 2 or more scatter symbols! X6 scatter symbols will award 11 extra bonus spins. There is no limit to the number of times you can add extra spins on to your running total. This means if the reels are in your favour, your bonus round can be quite a profitable one. Elephant Orb Feature – Available only in the bonus spins round, the elephant orb feature is an interesting one. As the reels spin you will see that some of the Pink Elephants faces hold glowing orbs in front of them. Every orb that lands will be moved to the orb meters at the left of the reels. As each meter is filled it will transform into an elephant’s face and an extra spin will be awarded. Once all meters have been filled, they will remain that way for the rest of the round. With a lot to offer in ways of features and extras, Pink Elephants is definitely a game you are going to want to try. Once you do you will be sure to come back time and again and quite rightly too. There is a high return for players combined with interesting twists to the main features. The elephant orb collection in the bonus spins is worth an extra 4 spins and that is on top of the potential new scatter spins you can land as well. 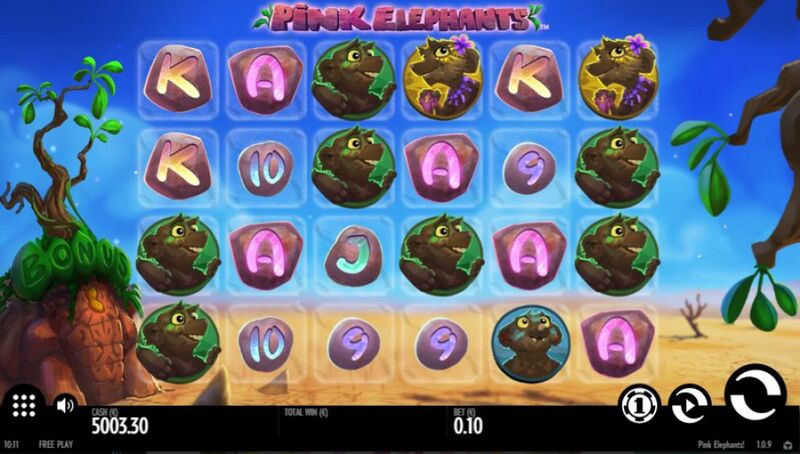 All in all, Pink Elephants is a game designed with the player in mind. It is fun, easy to understand and above all the wins come thick and fast in all aspects of the game too. Thunderkick Gaming have outdone themselves on this and we can see it being popular with game players for years to come.